PeakTweak is a program, which uses Green Button data to analyze electric energy usage during peak hours and encourages users to shift usage to off-peak hours. 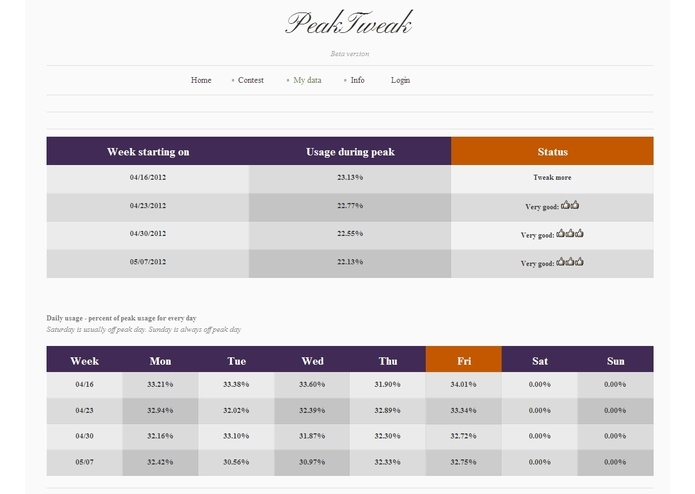 After uploading your data, you can compare your peak usage with other PeakTweak users. The goal is to minimize energy usage during peak hours, regardless of your total usage. Everyone can participate and compete PeakTweak compares the percentage of energy used during peak hours to the total energy usage of each user. This allows for fair comparison between consumers. There is no need to consider house size, number of family members or a type of heating system. PeakTweak only compares the percentage of peak usage, not kWh. For example, a condominium can be compared to a large house with a pool. Weekly Comparison In this app, peak usage is calculated for a period of one week– from Monday to Sunday. A monthly billing cycle is too long to give people timely feedback on their energy usage. By looking at their usage on a weekly basis, people will find it easier to think about how to shift their load from peak to off-peak, for example, by moving some usage to weekends. This might be especially important during heat waves when AC creates high peak usage. Social Networks Connection In order to participate you can login with your Facebook or LinkedIn account or create a PeakTweak account. Virtual Prizes After uploading Green Button data PeakTweak calculates if peak load was low enough. Current levels of weekly peak usage: • More then 22% - message – Tweak more • Less than 22% - 1 “Like” • Less than 15% - 2 “Likes” • Less than 10% - 3 “Likes” The “Tweak more” message means that usage during peak hours was too high and the consumer needs to shift load. A list shows the number of “Likes” earned during each week. Tangible Prizes Tangible prizes such as iPads or TVs can be funded by sponsors on three levels: • National – Global vendors, Federal Agencies • State – DSM programs • Utility – individually for their consumers Each sponsor can create their own rules and timelines to draw prizes for the winners. The sponsor can also create special rules to award consumers who did not receive any “Likes,” but significantly decreased their peak usage. 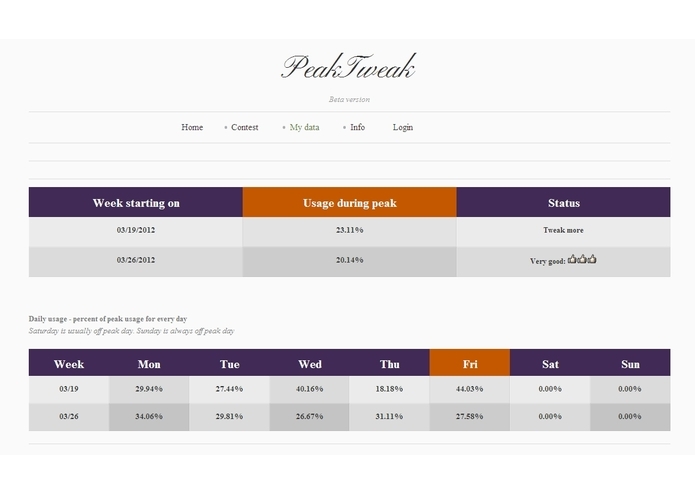 PeakTweak stores the total weekly load, but not the hourly load. Open Competition The ranking is based on the number of “Likes” and will show the utility name and the state. This allows for inter-utility or interstate comparisons and competition. In some states, transmission costs are divided between utilities based on peak contribution. Presenting peak data may encourage competing utilities to engage the consumer in saving energy during the peak. Good Peak Posture Some participants will not need to make any changes if they already have low energy usage during peak hours. It is important to award these consumers. If for some reason their peak usage changes (heat wave-AC), there is chance for self-correction. This aspect is especially important when seasonal peak hours change. Resources PeakTweak is not a resource for measuring and monitoring energy usage. Instead PeakTweak will provide links to: • Efficiency programs organized on your state or utility level • Vendors of home energy management systems • Popular applications, such as programs using Green Button format. Education and Introduction Electric utilities, even those with AMI systems, introduce Time of Use (TOU) rates gradually. PeakTweak can serve as a simple and inexpensive testbed for utilities to see consumer behavior. (1) Utility ID and state are not included in the current implementations of Green Button.